Bellwether Magic: Hidden Coven, Book 4 is a paranormal fantasy novel written by Kim McDougall. Bobbi had found her home within the Coven, yet her life was anything but the fulfilling and invigorating life she had hoped for. The rift she had inadvertently opened with her attempts at magic was spewing a horde of imps that had resisted nearly all her and the Coven’s attempts at keeping them under control. Quinn was visibly weakening each day as the mawr, a curse-driven illness, sucked his aether dry. All the aether transfusions in the world would eventually not be enough to keep him alive. Added to those burdens were her own fears that her power was corrupted by her demon blood, that its use would be increasingly accompanied by bitter rage and darkness that both delighted and horrified her. Rosie, her unlikely companion and friend, was an imp who had also escaped the rift, and she seemed to be the only good thing to have happened in the last few months. Rosie helped Bobbi navigate her way when chasing after the imps, and she had quickly become a trusted ally in almost all things. Bellwether Magic: Hidden Coven, Book 4 is an intense and powerful tale about a young witch imbued with the dark power of her demon father and her attempts to thrive as a member of the Hidden Coven. While you could read this book as a standalone, I’d strongly advise beginning with the first book in this series, Inborn Magic, to get the full impact of the story line and appreciate the development of each of the characters involved. I’ve loved seeing how Bobbi grows and learns to survive in her very individual world. As she develops maturity, it’s kind of fun to remember her first magical forays, where she often reminded me of the Sorcerer’s Apprentice as she dabbled in magic too powerful to be controlled and was powerless until rescued by the Hidden Coven. Bellwether Magic charts her coming of age as a wielder of magic as well as memorializing her growing ability to trust in her own judgment and that of others. McDougall’s novel is an impressive character study as well as an enthralling chapter in the Hidden Coven series. It’s most highly recommended. Bellwether Magic (Hidden Coven Book 4) by Kim McDougall is a stunning fantasy novel about a woman named Bobbi. Bobbi had accidentally opened a rift to another world with demons, and imps had come through to her world. Bobbi feels responsible for this disaster, and takes it upon herself to round them up before they cause major problems. But life isn't easy for Bobbi. Her magic, called aether, is dark and she's scared to use it; her boyfriend Quinn is slowly dying; and some of the imps won't listen to her. But when a magical spell goes wrong and a battle ensues, readers will wonder if Bobbi has the power to make things right again. I absolutely enjoyed reading Bellwether Magic (Hidden Coven Book 4) by Kim McDougall. It is fast paced, and will quickly hook the reader. The characters are very well created, and the relationships between them are realistic and will have readers saying, "Aww, they're so cute together!" The book is action packed, and is sure to keep readers wanting to know what comes next. I loved that the story is told through different perspectives, and it was nice to know the thoughts of many of the characters in the story. The book is incredibly well thought out, and has amazing foreshadowing throughout the story. Readers will really feel Bobbi's emotions as the plot unfolds, and they will feel like they are right there next to her. The story has many intense scenes that will thrill and excite the reader. I loved this book, and I would definitely recommend it to all fantasy and paranormal fans. Evil energy is drifting through the patched rift between the demon world and the Hidden Coven, as shown by the bellwether in Bellwether Magic: Hidden Coven Book 4 by Kim McDougall. Convinced that she is responsible for the problems the Hidden Coven is experiencing, Bobbi puts herself at risk to try to stop the creatures that managed to come through the torn rift, rounding up a group of imps to add to those already under guard in town. Bobbi is desperate to find solutions as Quinn’s health deteriorates, and her father’s threats are causing concern, not only for her own safety but the existence of witches and humans as well. With a command by the divine Lady and the prophecies of the Seer to guide her, Bobbi decides what must be done. Unfortunately, Quinn does not agree and Bobbi is forced to choose between love and what she sees as duty. Is there any way to have both? In a race against time, it is a tough decision to make and there is no guarantee that either path will yield positive results. Kim McDougall has written another spellbinding tale of witchcraft and demonic power in Bellwether Magic: Hidden Coven Book 4. Readable as a stand-alone story, starting from book one would be better so you can really understand the problems faced by the Hidden Coven and observe Bobbi’s development as a witch. The characters are as strong as their passions and you become immersed in the action as they fight to preserve their world and their love, leaving you anxious for the next book in the series. A young woman must embrace or deny her dark side to save the man she loves in the stunning paranormal romance, Bellwether Magic (Hidden Coven Book 4) by Kim McDougall. Bobbi has a secret that may jeopardize her new home, Hidden Coven. As a half-demon, half-witch, Bobbi lives between dark and light and is feared by many of the witches living in the Coven. When the darkness starts enveloping her, swallowing her light, Bobbi has no one to turn to. Her boyfriend and confidant, Quinn, can't help her; he is too ill. No one else knows her secrets. As if coping with the pain of watching her love die slowly before her eyes weren't enough, Bobbi must fight the demon blood burning through her veins, threatening to take over her mind and body. As Bobbi struggles to control her darkness, and she and Quinn work to make peace with his looming death, an unprecedented disaster strikes the Coven; revealing both Bobbi's secrets and her destiny. How can she defeat the darkness that is consuming her? Can she live without Quinn's balancing influence? Prepare to be stunned by this book in the Hidden Coven series, Bellwether Magic (Hidden Coven Book 4) by Kim McDougall. The story was compelling and the characters believable and real. I loved the characters, the story, and the way the author portrayed the conflict. With such a painful conflict dogging the characters, the book could have easily become dark and heavy, but Kim McDougall managed to keep the pace and the story flowing. The story was beautifully plotted, with vibrant characters and a fascinating story line. The characters and story are beautifully written and I look forward to the last book in the series. I would recommend this book to older readers as it contains light adult content. Bellwether Magic by Kim McDougall is the fourth book in the Hidden Coven series. The story picks up with Bobbi hunting down a group of imps that has crossed over from their world to earth through a rift that Bobbi created. While the rift wasn’t fully Bobbi’s fault – it was a trap set by her demon father – Bobbi takes responsibility for its presence and the trouble it has caused – like allowing imps to wander in where they could expose the coven to outside humans. At the same time Bobbi and the rest of the coven must deal with Quinn’s curse, which is slowly killing him by draining his aether away. As the coven deals with the rift and Quinn’s worsening curse, a visit from the Lady changes everything and forces the coven to take drastic measures to protect themselves. 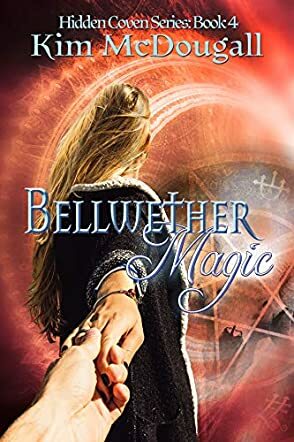 Bellwether Magic is the first book in the Hidden Coven series that I have read, and I must say that I am impressed by the amount of detail and emotion that Kim McDougall is able to fit into a short read. Picking up a new book in an established series can be a dangerous thing, not just because you don’t know if it will be good or not, but because you are unfamiliar with the characters and events. Because I am new to the Hidden Coven series, I found myself wondering who people were, how they were related to each other and what had transpired before. Would I have preferred more detail about the people and events that happened in earlier books? Sure, but Kim does a great job at relating the previous events in a way that is not an information dump and doesn’t bog the story down. Kim’s story sets a quick pace and the background details were conveyed such that I was able to easily relate to Bobbi and Quinn and understand what drove them and what made them strong and interesting characters. I will admit that I actually like Rosie the Imp better than the other characters, just because she is a fun, no-nonsense creature. Her brashness and bravado were a nice contrast to the more staid and conservative attitudes of the witches in the coven. I also enjoyed the history and tension established between the different characters, especially between Quinn and his mother, Jane, which created a depth to the characters and made them come alive. I recommend Bellwether Magic to readers who love stories of magic, romance, and a bit of adventure. Kim McDougall has done a wonderful job of making a vivid, detailed, and real world filled with magic and demons. I look forward to Kim’s next book in the series, and need to go find the previous 3 books.